Seabirds on the Farallon Islands and at coastal colonies had a late start to egg laying in 2015. On the Farallones, the first Brandt’s and Double-crested Cormorant chicks and the first Pelagic Cormorant eggs were seen in early June. Pelagic Cormorant numbers were the lowest since 2011. Tufted Puffins are also breeding on the island with over 60 active nest sites, fewer than in 2014. Biologists recorded the lowest count of Western Gulls in 45 years of monitoring on the island! U.S. 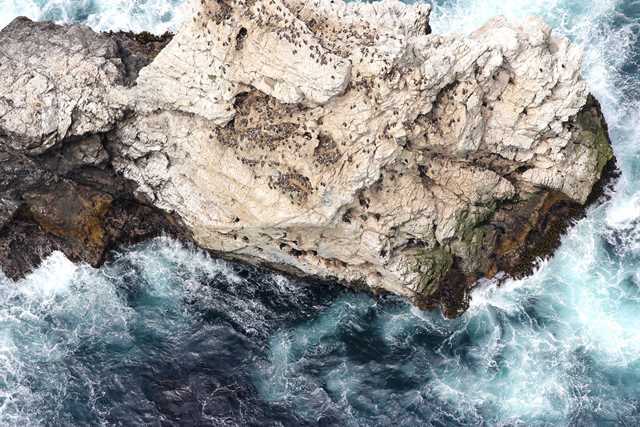 Fish & Wildlife Service biologists observed the first Common Murre eggs on May 8 in Big Sur, May 20 at Point Reyes, and on June 10 on the Farallones (USFWS unpublished data). As of late August, all of the chicks had fledged (left the rock) and gone to sea. Click to watch a great video of a fledging chick, plummeting into the ocean. Murre chicks leave the “nest” at 24 days old when they are still flightless. The murre father and chick spend several weeks to months together while the chick grows and learns to get food and live at sea. Recently there have been huge numbers of murres washing up on beaches, either dead or emaciated. Scientists are still figuring out what might be causing this much higher than normal mortality, and some data suggest that there is a lack of available food at sea. At Devil’s Slide, the restored murre breeding population was similar to 2014. Nearly 1,900 murres were counted on the rock during the 2015 breeding season (USFWS unpublished data). However, human disturbance continues to be a challenge to birds at this colony. This year small recreational fishing boats, and low flying planes and helicopters all caused disturbances. Please keep seabirds in mind when planning coastal flights and maintain 1,000 feet AGL or go a bit farther on- or offshore to prevent disturbance to sensitive nesting birds. Small adjustments in your flight path and altitude can make a big difference to seabirds. Boaters & kayakers – please remember both marine mammals and seabirds need you to keep your distance so they can feed and care for their young. Please stay 1,000 feet or more from marine wildlife, including seabirds, at all times. Lastly, a reminder to all anglers, please dispose properly of your line and hooks. It is very easy for marine wildlife to be harmed by discarded fishing line. In June and July Farallon biologists spotted fourteen injured sea lions with monofilament line wrapped around their necks or body. Help keep wildlife safe by keeping debris out of the water!